If you own a restaurant in the Chicagoland area, then you know how important it is to make your establishment attractive to those who walk or drive by, as well as those who have been frequenting your place for many years. Depending on how long you’ve been in business, you might be looking to make upgrades to your restaurant, and one of the best places to start is with the lighting. At Hortons Home Lighting in La Grange, Chicago, and Orland Park, we can help you choose the perfect restaurant lighting that will look great for years to come! You might have a restaurant location that you purchased many years ago, and there may have been issues with the lighting, the wiring, and more. As you built the new floor plan and layout, you made sure everything was up to code, and you added lights in the right spots. However, as the years have passed, those lights have started to look outdated, which in turn made your restaurant seem outdated. Updating your lights now can breathe new life into your establishment and help attract new customers. Perhaps you’re building a new restaurant and you’re looking for the finest in modern lighting. You might have a specific style in mind, such as Industrial or Art Deco, and our showrooms can provide everything you need. We’ll look at your architectural plans and recommend the best lights for each area of your business, from the exterior to the front of house to the kitchen. The possibilities are endless! The exterior of your restaurant should be eye-catching as well as functional, with lights in the right places for easy access to your front door, safety while parking, and more. At Hortons, we’ve worked with many restaurateurs who have had issues with their exterior lighting. They either felt that the outside of their establishment was too dark, or that the lighting they had didn’t accentuate the architectural features of their building. Whatever the case may be, the right exterior fixtures should do two things for your restaurant — showcase any design features that are present and help people find their way safely to the front door. If you have an outdoor sign with your restaurant name on it, then it’s important for it to be lit up after dark so that people know they’ve arrived at the right place. You’ll also want to create an ambience that is inviting, and that can be achieved through pathway lighting. If there’s a sidewalk leading to the door, add lights along the path and post or lantern lights near the door. If you have landscaping around your building, putting lights around the perimeter will highlight any trees or shrubs on your property, as well as any architectural features, such as arches or interesting textures. Exterior “wall washing” with lighting can be a great way to accentuate design elements, especially if you have a unique motif that fits the style of restaurant that you own. Which Exterior Fixtures Do You Need? Each restaurant will need different light fixtures, and our expert staff can help you choose the best ones. You may want post or pier lights near your parking area, followed by pathway or garden lights near the walkway. Outdoor sconces can look great at the entrance, and spotlights will be needed for any signs or features you want to highlight. Above all, you want customers to feel welcome as they drive or walk up to your restaurant, and that they can safely find their way inside. Once people enter your restaurant, they will be greeted by the hostess or maître d’, and hopefully seated as soon as possible. However, they may have to wait for a few minutes until a table is ready, or they may have arrived earlier than their reservation time. If customers will be waiting in the entryway, then you’ll want to make sure the area is properly lit. Wall sconces are a great option here, as are well-placed mirrors. If you have a small entryway or waiting area, then mirrors will help reflect the light around the space, making it seem bigger than it is. Hanging lights should only be used in entryways with high ceilings (10 feet and above) so that taller people don’t have to avoid the fixtures as they enter. Perhaps your restaurant has a grand entryway that leads to the dining area. Guests enter through double doors, and they’re greeted by a wide space that’s furnished with chairs, artwork, mirrors, and more. If this is the case, then a large chandelier can be the perfect light fixture for your foyer. The right chandelier can be the statement piece that you need to set the tone for your restaurant and to let people know that they’re in a quality establishment. We can help you choose a new chandelier that will look great in your restaurant, and that is a style that matches your current decor or that gives you the opportunity to upgrade your decor. Which Entryway Fixtures Do I Need? The size and configuration of your entryway will determine which fixtures you’ll need. As we’ve highlighted, wall sconces are a great way to go for smaller spaces, and grand chandeliers should be reserved for large foyers and waiting areas. We can help you determine which lights and what sizes will be appropriate, as well as where to place them for the optimal lighting design. People may not only come to your restaurant for the great food, but also for the great drink specials and happy hour prices. If guests frequent your bar, then it’s imperative to have the right lighting in place. Several small pendants above the bar will help people see as they order drinks, and can make for perfect mood lighting as people sit at the bar. You’ll want each fixture to be high enough above the bartop so as not to hinder people as they sit down or lean forward to talk to the bartender. Track lighting is another good option for bar areas, especially behind the bar. Track and rail lights can help bartenders and servers see what they’re doing as they make and retrieve drinks. The lights will also accentuate the shelves of spirits and liquor, and the fixtures don’t take up too much space. 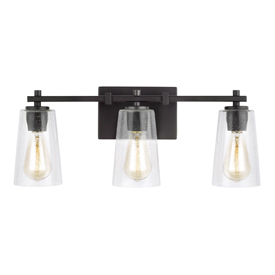 Rail lighting is also highly customizable, and you can add or subtract lights as needed. Which Bar Fixtures Do I Need? Your bar lighting doesn’t have to be complicated, and the right fixtures in the right spots will make the space both functional and inviting. Single pendant lights hung at equal intervals along the bar will make for great mood lighting, and track lighting behind the bar will help your staff see what they’re doing. LED strip lighting can be a great option near the floor, especially if you have fixed barstools and a foot rail. Let Hortons help you find the ideal bar lighting today! No matter how big your restaurant is, you’re going to need places for people to sit. Whether you have booths lining the wall, tables in an elaborate dining room, or a combination of both booths and tables, you’ll want to have plenty of seating options, as well as the proper lighting above each one. People want to be able to see as they eat and converse, and lighting can play a huge part in a person’s dining experience. Booths that line the wall of your restaurant can take up quite a bit of space, and it’s important that they’re properly lit. Wall sconces and other accent fixtures can provide the right amount of illumination for customers, and you can direct the light from the fixture upwards, downwards, or both. One light per booth should suffice, and with it, you can provide the perfect mood lighting for any occasion. 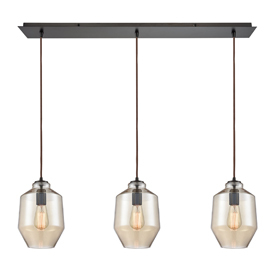 If you’d rather have hanging lights above your booths, then pendants or semi-flush mount lights are great options. You’ll want to take into account the height of your ceiling so that the fixtures can be mounted and hung properly, with plenty of clearance above the table in the booth. If you have a large, round booth in the corner of your establishment, then a mini chandelier might be the right option. You can also opt for lantern lights and other hanging fixtures that keep with the motif of your restaurant. For any tables that sit away from the wall, such as in the middle of your dining room, you’ll want to be sure that they have plenty of light as well. Hanging pendants can be ideal here, since you can install them in a straight line that follows the arrangement of your tables. This can create consistency and symmetry within your restaurant, making things seem orderly and organized. If you have large tables for bigger parties, then it’s essential to have the right lighting above these spaces. Island lighting can be a great choice, as can multiple pendants arranged in a row. Again, as with any lights above a table, you’ll want to be sure there’s plenty of clearance and that no one will hit the light with their head when they sit down or stand up. This will be contingent on the placement of the table, since the placement of the light fixture is most likely fixed. Which Fixtures Do I Need? When lighting your restaurant’s booths and tables, think about adding fixtures such as wall sconces, mini pendants, and semi-flush lights. Your booth width will determine whether you need one or two sconces, and the ceiling height and table widths will determine how high to hang your pendants and how big the fixtures should be. You want to illuminate each tabletop, but not necessarily bathe them with light. When thinking about which lights you’ll install above your tables or next to your booths, lighting controls should be towards the top of the list. You may have found the perfect fixtures for your seating areas, but without the right switches and dimmers, your lighting won’t be as dynamic as it could be. It’s imperative to set the right ambience, whether it’s during the lunch rush or while the dinner crowd is in full swing. If you’re a popular choice for couples, then it’s good to be able to dim the lights and create a more intimate setting. Your restaurant is likely divided into “zones” or areas where people can sit at the bar, at a table, or at a booth. These zones help the hostess seat people on a rotating basis, so that each server has a chance to wait on customers. Zones can also be helpful when it comes to choosing dimmer switches, since you’ll want to designate a switch or two for each area. You’ll want to be able to dim the sconces in each booth, while leaving the lights above the individual tables as they are, or vice versa. You may have a private event room or VIP area that has chandeliers and pendants, and you’ll want to able to raise or lower the lights, depending on if the area is occupied. Your lighting controls can be in a centralized location, so that you and your staff don’t have to walk around the entire restaurant to dim or turn off the lights. You may lower the lights at a certain time each evening, such as when the dinner menu starts, and having a bank of switches will allow you to lower the lights and set the mood for the rest of the night. Which Controls Do I Need? Dimmer switches are key for any restaurant, as are traditional light switches. You’ll need to think about every area of your business, from the front of house to the bar to the dining room to the kitchen. At Hortons, we can supply dimmers, timers, sensors, and much more, making it easy to control the lighting in your establishment. When it comes to restaurant lighting, your customers rarely see the back of the house where the kitchen, pantry, and utility areas are located. Unless you have a special chef’s dinner each month, customers never see the kitchen, but that doesn’t mean that you don’t need the proper lighting for those who work hard for you every day, prepping and cooking each meal that’s ordered. The kitchen needs bright, functional lighting so that everyone can see clearly as they’re chopping and slicing or sauteing and plating. Whether the kitchen is large or small, there will be plenty of reflective metal in the stove tops, the prep stations, and more, which can make the room seem very bright. Fluorescent lighting can be a good choice, and our team can help you choose the right options that you can put in the right places. If you want to integrate lighting into your industrial kitchen hoods, or you need lights for the serving window area, then let Hortons provide you with the ideal products. You’ll also need strong lighting options for your freezer and pantry areas. For the freezer, it will be imperative to have industrial lights that can withstand the cold temperatures. You’ll also need cages around each bulb to protect against breakage. For the pantry or storeroom, recessed lights can be ideal, since you don’t want fixtures hanging down and obstructing the shelves as your staff are retrieving boxes and cans. When it comes to kitchen and utility lighting, you’ll want to place function over form. No guests will likely ever see these lights, so you can install simple fluorescent fixtures and other options that help your staff see as they get items from the freezer or prep vegetables for a new dish on the menu. You’ll want to be sure that your pantry and freezer are properly lit, so that people can enter and exit safely as they’re rushing in and out during the busy times of the day. Hanging fixtures with wide hoods can be a great choice, since they’ll direct the light downwards to the work surfaces of the kitchen. When guests arrive at your restaurant, they may want to wash their hands or use the restroom before they sit down to enjoy drinks and dinner. It’s essential for your bathroom lighting to continue the theme of your front of house and dining room fixtures, and for them to provide the proper illumination as people use the facilities. Everything from the vanity lighting above the sink to the recessed lights in the stalls need to provide both form and function so that your guests are safe and comfortable. Your restaurant bathroom may be small and intended for a single occupant, or it may be large and be lined a long row of sinks, followed by a long row of stalls. Whatever the case may be, vanity lighting is key to each sink area. Traditional vanity fixtures above the mirror can work, but it’s important to remember that guests may be checking their makeup or adjusting their attire before they rejoin their party. Light from above can cast unflattering lines across a person’s face, which is why vanity sconces on either side of the mirror can be a better choice. If you have a long row of sinks, then placing a sconce between each mirror can provide the light you need and help you create a perfectly consistent lighting design. For single-occupant bathrooms, a small vanity fixture above the sink can suffice, but think about what other lighting options you can install. No matter the size of the room, ceiling lighting is essential, and flush-mount or semi-flush mount lights can be ideal. As we stated above, it can be a good idea to have recessed lighting in the stalls, so that nothing is hanging from the ceiling and impeding people as they enter. 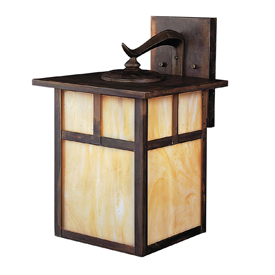 You’ll want a sconce near the door so that people can see as they enter or exit the bathroom. Any bathroom, no matter where it is, needs proper ventilation. You want your restaurant bathroom to be clean and inviting, and our showroom can provide you with the ventilation fans to keep it that way. You want quiet, functional options that will circulate the air and keep everything fresh. Whether you have a small, one-person restroom or a large, open bathroom, having fans in the right spot will make everything better. The bathroom of your restaurant should be a priority when it comes to lighting. Besides the entryway and the dining room, it’s the one area where every customer will visit at least once while they’re in your establishment. Wall sconces and vanity lighting will bring the light down to eye level, and recessed lights in the stalls will make things more comfortable. Flush-mount or semi-flush mount fixtures are great for the ceiling, and ventilation fans should be placed in the appropriate places. Let Hortons help you find the right bathroom lighting options today! What Style of Lighting Do You Want? So far, we’ve covered the different areas of your restaurant and how you can light them for the appropriate mood, the appropriate function, or both. However, once you know where you need lights, next comes perhaps the most important decision of all — what style of lighting will you choose? There are so many options to choose from, and it can seem overwhelming to pick one that fits your restaurant. At Hortons, we can help you filter through all of the fixtures that catch your eye and assist you in narrowing down your choices. When it comes to lighting, the term “modern” can seem a bit ambiguous, and the definition can change from year to year. 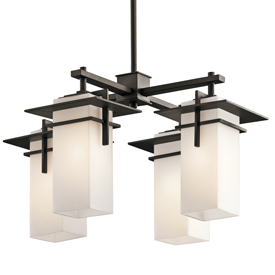 Simply put, modern lighting refers to fixtures that don’t appear dated, and that have clean lines and unique designs. There may be some geometric shapes integrated into the design, and there are definitely inspirations from fixtures of the past. There may be glass or crystal shades, or else opaque shades that direct the light in a certain direction. You can find circular, oblong, and rectangular fixtures in our modern lighting section, and we’ll gladly explain the features and benefits of any light in our showroom. Industrial lighting doesn’t just apply to fixtures that you find in warehouses and buildings with lots of brick and stonework. Many restaurants today have opted for that “industrial” look, with bare beams and exposed fixtures that accentuate the design of the building. If this describes your establishment, then industrial lighting is likely the way to go. Industrial pendants and chandeliers can look great in your dining room, and they often feature cages or light guards that provide that unique touch. You can also find fixtures with bare bulbs encased in glass globes, as well as lights with designs that hearken back to the gas lamps and lanterns of old. Metal finishes play an important part in industrial lighting, and we can show you a number of options when you visit our store. Art Deco lighting can provide that perfect eclectic look for your restaurant, with geometric-designed fixtures that can be placed anywhere in your business. The broad lines and angular shapes of Art Deco fixtures make them statement pieces in any spot, and they can instantly set the tone when people walk through the front door. You can also find fixtures with inspiration from other parts of the world, such as India and the Far East, and the gold and silver finishes can make it seem like you’ve stepped back in time. 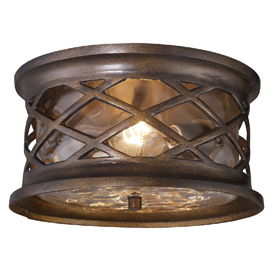 Vintage lighting can include many fixtures that find their inspiration in European design. Lamps and chandeliers come with ornate embellishments, and the dark finishes on the fixtures can make them stand out in any part of your restaurant. Vintage lights can have that perfect “boutique” look that makes people stop and take notice when they sit down at a table or belly up to the bar to order a drink. You can find both interior and exterior vintage lighting, and we can help you decide which ones are the best fit for your business. A restaurant has many components that come together to make it comfortable, inviting, and functional. From the parking lot and the front entrance to the dining room and the bathrooms, everything is intended to make guests feel welcomed. Your restaurant lighting plays a large role in all of these areas, and the team at Hortons is here to help you choose the best fixtures for every spot. If you’re building a new restaurant, or you want to update the old fixtures in your current establishment, then please call or visit our showroom today. We can work with you, your builder, and your interior designer to determine which lights will be ideal. What else is important that we know before we reach out to you about your restaurant lighting project?